Regional markets ended mixed following a 0.9% slump in Japan’s Jan-Mar quarter GDP (consensus: -0.5%) as the March natural disaster pushed the country back into recession. In line with the cautious regional bourses, FBM KLCI also ended with lower gains of 2.8 points from as much as +9.3 points intraday amid the 0.12% upgrade in the MSCI All Country Asia ex Japan Index Fund and positive expectations of the ongoing 2-day Invest Malaysia in New York. Trading volume declined to 891 million shares worth RM1.49 billion as compared to Wednesday’s 0.94 billion shares worth RM1.91 billion. The FBM KLCI tested our targeted weekly 1545-1552 resistance zones yesterday but profit taking capped a strong closing. 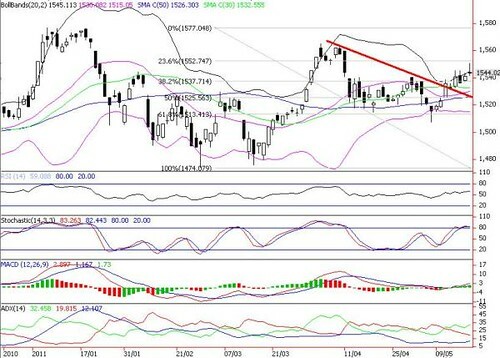 We reiterate our view that the technical breakout of key resistance levels at 1530 points (downtrend line) and 1537 (38.2% FR) coupled with the golden cross in MACD bode well for further upside in KLCI to retest 1552 points. However, average daily volume needs to build up to one billion shares for a more sustainable uptrend to surpass 1552 points and retest April’s high of 1566 points. Immediate supports stay at 1530 and 1525 (50% FR). More solid support is situated at 1515 (lower Bollinger band). Daily FBM KLCI Is Still Upside Bias.